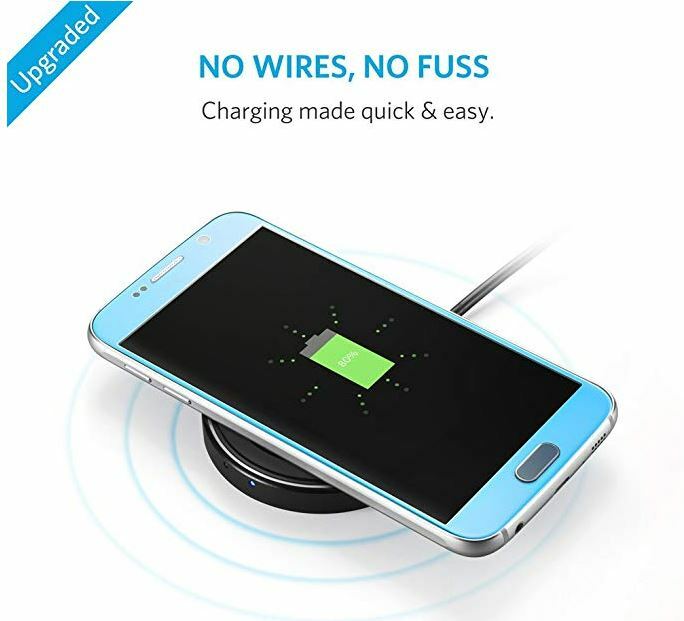 Get this Anker Wireless Charging Pad for $9.99 (Retail $59.99)! I bought one of these a few weeks ago and it is AMAZING!! It’s so much easier and cost effective with how often our wired chargers break. -Intelligent Features: Temperature Control activates at 107° fahrenheit to keep your device safe. Power-efficient idle mode never overcharges your battery or wastes energy. Using while charging or misaligning devices may cause higher temperatures. -LED Indicator Lights: Red means it’s ready to charge, blue is charging, and both together let you know your device is fully charged. Blinking lights mean an unsupported device has been detected. -What You Get: Anker PowerPort Wireless (Single-Coil Wireless Charger), 3ft Micro USB cable, welcome guide, 18-month hassle-free warranty and friendly customer service. This works with iPhone 8 / 8 Plus, iPhone X, Galaxy Note 5, S7/S7 Edge/S6/S6 Edge/S6 Edge Plus, Nexus 4/5/6/7, LG G3 and Other Devices.